As a first year medical resident, my life was utter chaos. I barely had time to eat, let alone worry about anything but being a doctor! I would be home long enough to sleep for an hour or two, water my plants, pay my rent and all of my student loan bills, and then I was off to the hospital again! I knew that I could save money and time on my student loan bills by consolidating all of my student loan debt, so I made it my goal to consolidate my loans the next time I had a spare second. My next spare second came about a week and a half later during a short break at the hospital. I called a company that advertised in one of the medical magazines that was at the hospital. I told the company that I only had a few minutes and that I wanted to do an application to consolidate my medical student loans. They told me that they would just need to ask me a few questions. Well, these "few" questions took about 30 minutes. I told them that I didn't have time to finish the application because I was a medical resident and that I was pressed for time. I asked them if I could finish the application online and they told me that the application wasn't available online. They said that the application would only take about another 20 minutes or so, which I did not have, so I just hung up. What kind of person has 50 minutes to just sit around and do a consolidation application over the phone, let alone a medical resident? I gave up on the idea of consolidating my loans because I didn't think that I would ever have enough time to dedicate to completing the application process! Then, one day (actually, I should say one morning, considering that it was 4:00 a.m.), I was trying to get a second of shut-eye on a crash-cart, when I heard a few doctors talking about how they consolidated all of their medical student loans with Medical School Loans. They said that they were saving a lot of money from Medical School Loans' low fixed interest rates, additional interest rate reductions and great payment options. I interrupted and said that it probably took them several days to finish their application on the phone. They told me that they did it all online and that it only took a few minutes. I was thrilled to think that I could get onboard with a consolidation company that would save me time and money! The next day while I was at home trying to pay my bills, I decided to see just how long it would take me to complete my online application with Medical School Loans. I finished the application in less than 10 minutes! Medical School Loans' website was easy to follow, and their E-sign option made it so I didn't have to wait for the application to get to me by mail. In the end, I saved almost 50% from what I was paying before. I tell all of my co-workers now to consolidate with Medical School Loans because I know that medical professionals don't have time to sit on the phone and complete an hour-long application process! My twin brother, Brock, and I have always been in competition with each other. When he said that he was going to medical school at John Hopkins, I couldn't let him outdo me, so I went too. At school, we were always trying to one-up each other, whether with grades, applying for residencies and even getting dates! So, it is no wonder that when we graduated and I mentioned that I was going to consolidate all of my medical school loans to save money, he said he would consolidate too. 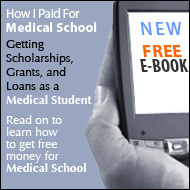 I researched it out on the web and came across Medical School Loans' website. They offered great incentives and seemed to be credible, so I called and started my application with Medical School Loans. My loan specialist, Jennifer, was so helpful and she explained the whole process to me. Since I had both federal and private student loans, Jennifer helped me consolidate all of my federal loans and all of my private loans in two separate consolidations. She said that it was beneficial to me to keep them separate since I would lose all of my federal benefits if I consolidated them together. She told me that private loans do not have federal benefits like a grace period, deferment and forbearance options, loan forgiveness upon death and other options. All of this made sense to me and I was glad that Jennifer took the time to educate me on the differences between the two consolidations. I can't forget to mention that not only was the assistance that I received from Medical School Loans very helpful, but also by consolidating I saved a lot of money! I chose one of their graduated payment plans for both of my consolidations and my monthly payments are just about half as much as they used to be! It's really too bad that Brock didn't follow my lead this time and consolidate his loans with Medical School Loans. He bragged that he was sure that the private lender that he found would be a better deal. His lender talked him into consolidating all of his federal and private loans together. A few months later, he had some money trouble and was having a hard time making his consolidation payments. I told him that he should talk to his lender and see if he could use his forbearance option to give him some time to focus on getting financially stable again. Brock called his lender, but his lender told him that because he consolidated all of his federal and private loans together, he gave up his federal loan benefits. Therefore, he had lost his forbearance option. Brock had not been informed by his lender that he would lose his benefits like I had been with mine. Unfortunately, he had to learn the hard way. With student loan bills, credit card bills and expenses for living, he was in debt over several hundred thousand dollars. At age 28, he had to declare bankruptcy because he was so overloaded with debt. Perhaps if he had the option of forbearance and a little time to get caught up on his bills, he would not be in this situation. I do feel bad for Brock. However, I am doing great with my finances. My monthly consolidation payments are low and I know that if I have any future financial troubles, I still have my federal benefits. Upon graduating from medical school, I consolidated my student loans with a large, national loan company. I figured that being a large company, I would have no problems with my loan consolidation. A few months later, I had a question about my monthly statement, so I called the company's helpline. It took me about five minutes to get through the voice-automated system. Then, after entering in all of my information, I was on hold for another ten minutes. Finally, a voice came on the line, and I tried to talk, but it was just another automated voice telling me the balance on my loan and that my payment was due even though the whole reason I had called was to ask a question about my payment! I finally gave up and just made the payment without getting my questions answered. About three or four weeks later, I decided to try to call the company again with the same question. Again, it took me several minutes just to get through the automated directory, and again, I entered in all of my personal information. And AGAIN, I was on hold for close to 20 minutes. The same automated voice then came on and told me my balance. I kept pressing "0," hoping that an operator would allow me to talk to a "real-life" person, but I just kept being put on hold again. I finally gave up. It was easier just to not have my question answered than to waste time I really didn't have waiting on the phone to try to talk to a person. One day, I was venting to one of my co-workers about how frustrating it was to be on hold for such a long time without ever being able to talk to a human. She told me that she loved the company that she consolidated her medical student loans with, Medical School Loans. She said that the loan specialist who did her initial application is the same person she calls directly any time she has questions or concerns about her consolidation loan. This loan specialist handled her loan from start to finish and knows everything about her loan. My co-worker also said that she can e-mail her loan specialist directly with any questions. This made me sorry that I consolidated with that other company. Having a live person answer your questions would be so beneficial! If anyone asks me if I like the company that I consolidated with, I tell them "No!" and that if I could do it over, I'd go with Medical School Loans! A few months after I graduated with my undergraduate degree, I decided to consolidate my student loans with a consolidation company I found on the Internet. This proved to be a very bad decision. They told me that my interest rate would be 4.75%. This seemed like a great rate, and I was excited about being able to save so much money! I was also toying with the idea of going on to medical school, and since I discovered that I would have such a low payment on my consolidation loan, I decided that I could afford to enroll in med school. A few months later, after I had been accepted into medical school, I received the first bill for my consolidation loan. At first when I saw that my interest rate was 5.375%, I thought that it was a typo, so I called my company's customer service line. The representative told me that the interest rate of 5.375% was correct. I told them that when I completed the application, I was quoted a rate of 4.75%. The representative told me that I had not consolidated when I was in my grace period, so I was not eligible to receive the lower rate. He told me that the representative that helped me at first must have been confused. I told him that the first interest rate that I was given should be the one that they honored and that it wasn't my fault that their representative was confused! He laughed and told me that that was not how it worked and said that there was nothing he could do to help me! I was very upset because even though it wasn't a huge difference, I was about to begin med school and every extra penny that I could save would help. Also, I think that a consolidation company should stand behind their word and not just tell me that their error was just too bad and without doing anything further to help me. I ended up having to take out even more loans to pay for medical school. Once I had graduated, I received a letter from my company saying that I was eligible to consolidate my medical school loans with my undergraduate loans that they had consolidated. There was no way that I was going to even consider giving them my business again when they would tell me one thing but not honor it. One of the attending physicians at the hospital where I was doing my residency told me that he had consolidated his medical student loans with Medical School Loans. He said that Medical School Loans had incredible customer service and that he had borrower benefits that allow his interest rates to be reduced by 1.25%. Since I had new loans to consolidate, I was able to consolidate my new loans and my old loans with Medical School Loans. The rate that they quoted me was the rate that I got and I saved a lot of money by consolidating all of my loans together. And, because Medical School Loans only works with medical students and physicians, I felt like a member of a very elite club. The attending physician was right-Medical School Loans' customer service is great! I recommend them over the competition any day! I had consolidated my medical school loans with a small, local company. They offered an interest rate reduction of 1.00% after I had made 48 consecutive on-time payments. I worked hard for four years to make sure that my payments were on time so that I would qualify for this reduction. Finally, they granted it to me. It really made a difference with my payments! Then, I decided to move across the country to start practicing medicine in a small, rural area. During all the chaos of my move, I forgot to make my consolidation payment. Once I got settled in my new home, I found the consolidation bill and immediately picked up the phone to make my payment. It was about a week late, but I figured that they would have a grace period of some kind, and since I had never made a late payment before, they would understand my situation. I made my payment, thanked the customer service representative and was about to hang up when he said, "I hope that you realize that this late payment takes away your 1.00% interest rate reduction." I couldn't believe it! I tried to explain my situation to the representative by telling him that I had never made a late payment in four years and was only a week late this one time. But he told me that they had a policy about their interest rate reduction program, that even after a borrower earned the rate reduction, the borrower would have to keep making payments on time in order to keep the lower rate, regardless of the circumstances. I was furious, to say the least. I was talking to my friend, Josh, back in my old hometown, and he told me that I should have consolidated with Medical School Loans. He told me that he did and that his rate reduction was guaranteed, regardless of the situation. He told me that once he qualified for rate decreases of 1.00% and 0.25%, he could not lose those benefits! He also said that it only takes 36 consecutive on-time payments to earn Medical School Loans' 1.00% interest rate reduction, and that you can qualify immediately for their 0.25% interest rate reduction just by signing up to pay with their automated debit program! He explained to me that most consolidation companies offer their incentives to get people to sign up with them, but after you consolidate, they don't care if you keep the interest rate reductions! He said that Medical School Loans is different in that they want their customers to continue to save money, which is why they guarantee their interest rate reductions for the life of the loans! If I could go back in time, I would have consolidated with Medical School Loans. My advice to those shopping around for a consolidation company is to ask if they guarantee their borrower benefits like Medical School Loans does. If not, you most likely will end up losing them, just like me! The Healthcare Career Resources column is presented by HealthcareCrossing, America's leading job search site dedicated to getting jobs for healthcare professionals. Even as a young child practicing medicine on your stuffed animals, you knew that you were destined to become a physician. But the road to obtaining your medical degree takes more than just the ability to mend the imaginary wounds of a teddy bear. Enter your Name and Email address and gain FREE access to a comprehensive guide for managing your loans. MSL- Medical School Loans © 2019. All rights reserved.